Since the end of June, I’ve been pondering the factors that might describe a Drone Congregation Area (DCA), those mysterious locations where honeybee queens meet up with drones to mate. 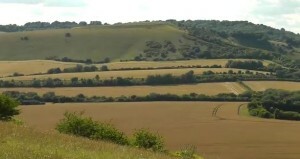 Having found eight in my local area, I can only say that I have a good idea of where to look for DCAs in this area of chalk downland and that broadly my findings agree with South African research, rather than British or German. The Ruttners working in Germany in the 1960s emphasised visual cues in the landscape (flying to maximum light intensity on the horizon and then coming to a visual dead end), while Cooper in Britain in the 1980s focused on rising air currents. Belatedly I have come across GD Tribe’s work in South Africa in the 1980s in which he identified air turbulence and elevations. My site findings tend to agree mostly, but not entirely, with those of Tribe in South Africa. A local peak in the landscape, no vertical obstructions and especially the presence of a breeze were the common denominators in my discoveries. Aspect didn’t seem to matter, light intensity didn’t quite match and I couldn’t quite measure rising air currents or identify where they might be. Where my observations differed from almost everyone was that the drones seemed to prefer a height of about three metres above the ground, not the much greater heights up to 10 metres experienced elsewhere. Locations of DCAs may be so difficult to define because honeybees may react differently in different topographical environments. Indeed even different types of honeybee may well have different behaviours: researchers have already discovered that Italian drones and Carniolan drones congregate at different heights above the ground . Next season, I plan to visit areas of different topography and areas where there are more known honeybee colonies. The area in which I have been looking is relatively sparsely populated, so I am intrigued to know if I will get an even greater drone response next year at the peak of the mating season and on the edge of a town where there are known to be quite a few colonies.